People walk covering their face to prevent dust at Koteshwar in this file photo. KATHMANDU, Feb 3: In a crowded microbus at Dholahity, a young man of around 20 seems to be desperate to look outside the window screen to find out where he has reached. But, the black smoke and heavy dust blurs his view and leaves him disoriented for a while. Suddenly, he heard the conductor shouting 'Satdobato!' and rushes toward the door. With great difficulty, he somehow manages to reach the door by pushing aside all the hustling and bustling passengers wearing masks. He lingers for a while ignoring the conductor who is yelling at him for quick payment. After a while, he settles the fare, wears his shades on, pulls up his mask which was clinging on his neck and he finally disappears in the dense fog of dust within seconds. The conductor then gets back to his job and starts calling for passengers. Meanwhile, a city bus passes by the same road blowing a large amount of dust in the air. The conductor, who was shouting with his mouth wide open, started coughing and sneezing and so did the other people around him. He then cursed himself for washing his mask early in the morning. This shows how much important a mask has been for the urbanities these days. The unmanaged road widening drive has contaminated the air so much that very few people dare to get out without their masks. It has not just been a need but a compulsion. “There was a time when I preferred walking instead of using the crowded public vehicles but now the pathetic condition of roads has compelled me to use the same vehicles,” said Urjina Shahi, 22, of Lainchaur. In the busy roads of Kathmandu, it's hard to see someone's face, from street vendors to pedestrians, without wearing masks. “We leave home in the morning neat and tidy but when we return home it's hard for our family members to recognize us due to our roughened hair and filthy clothes,” Shahi added. 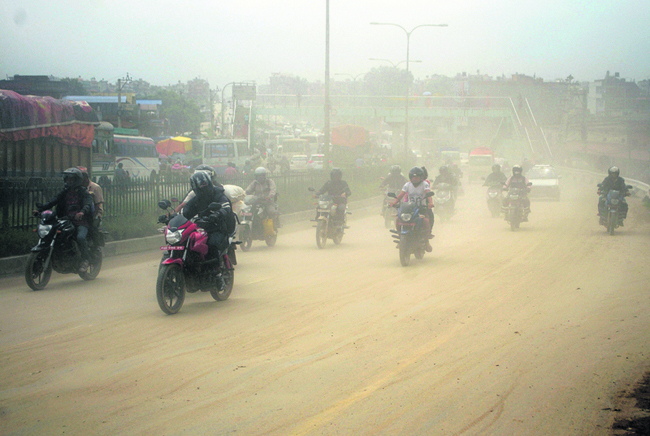 Motor bikes passing through a dusty road at Jadibuti-Koteshwar road section in Kathmandu. According to Environment Performance Index, 2016, Nepal falls in the 149th place among 180 countries in terms of air quality. This ongoing road construction project has got a lot to do with that. 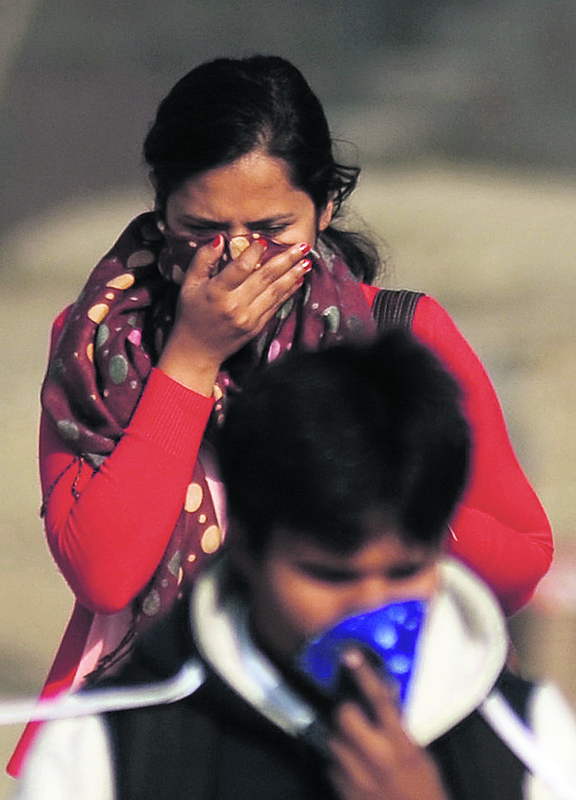 “We don't inhale oxygen these days instead we take dust, smoke and chemicals which are degrading our health seriously,” said Smita Thakuri, 20, of Gurjudhara, Kathmandu. She thinks it's impossible to fight the dust without a face mask. “I know I look like a terrorist with this scarf, shades and mask but I have no other option because of my health concerns,” Thakuri added. Increased dust in the air is inviting a lot of respiratory and skin problems for the people. The unique designs and styles of masks have been a great fascination for a lot of people. “Most of the middle-class and lower-class people come to us for buying the masks while high-class people go to malls and shopping centers as they prefer using surgical masks,” Karki added. Even after spending about five years, the government has been able to complete only 26 percent of the construction works.